I made another yarn bowl!! 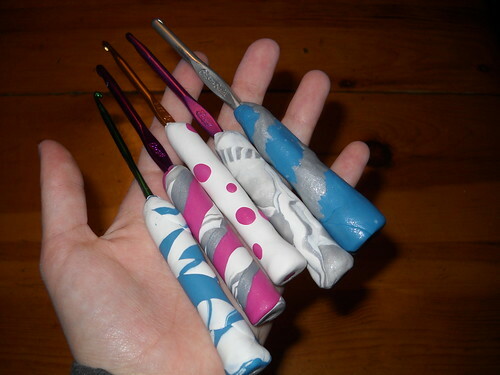 I also added polymer clay handles to a few of my crochet hooks, just to see if I liked the feel of it. 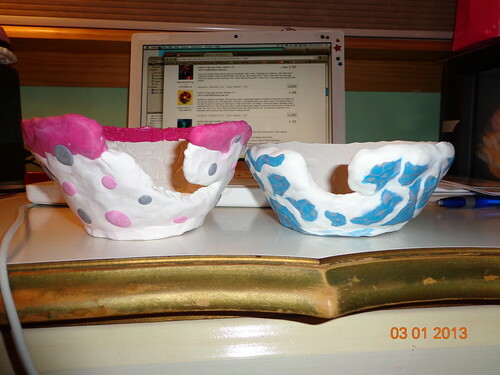 Both were successful, though the yarn bowl was a bit stubborn and didn't want to bake! I finished up the big 1 lb. block of polymer clay (CraftSmart brand) and all the leftover blue and silver from my first yarn bowl, along with another package of pink that I bought a month or 2 ago. "I" is my favorite of the hooks. There are definitely flaws in both the hook handles and the yarn bowl, but I'm still pleased with my work. For personal use, everything works just fine. 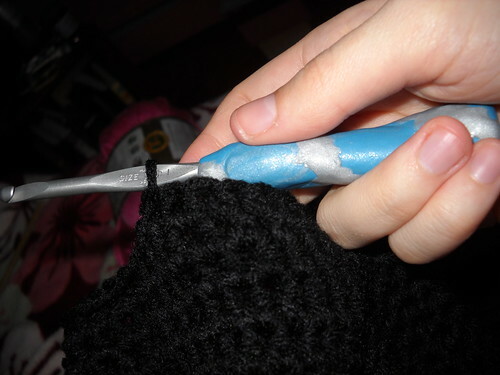 I think my biggest problem this time around was my lack of tools. It's important to keep clay & food utensils separate; as this was a spur of the moment activity, I had nothing out and ready. Even with all the flaws, I'm still glad that I tried something a little different, and that it was mostly successful. And this little adventure also made me assess my hook preferences. I've found that I definitely like Boye better than Bates, but I have a decent number of both due to family 'hand-me-'rounds" and thrift store purchases. You might noticed that some of my photos are date-stamped. I just got a new camera this past week (after complaining about my old one, and getting the go-ahead from the fiance) and I've been testing out the various features. New bowl on the left. 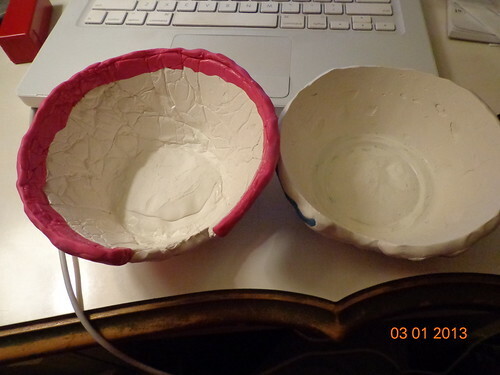 I use a regular bowl to give me an idea of the size, and I covered it with tin foil, giving bowl # 2 the wrinkly interior.